Dj-ing isn’t what it used to be back in the day when a DJ just had to set up a few spinning lights, put some records on the turntable, and have fun. The “fun” part hasn’t changed, but almost everything else about DJ-ing has become more complex. DMX lighting, LED video panels, digital workstations and other new technologies are great tools, but they can leave DJs with a lot of questions. Now American DJ and American Audio have come up with a convenient way for those DJs to find answers. The company has introduced ADJ University (www.adjuniversity.com), a free online learning program offering in-depth, but user-friendly video instruction to any DJ. Blending subtle humor with clear, easy-to-follow lesson plans, the videos cover a wide range of topics from DMX programming and audio mixing to gear maintenance and marketing DJ services. The video courses in ADJ University have tests at the end. Anyone who completes the courses and the tests earns a PhD-J degree and receives a diploma and a free ADJ University T-shirt. Enrolling in ADJ University is simple, just visit the American DJ University website (www.adjuniversity.com) and click on the ADJ U banner. Although the site is open to DJs world wide, residents of the United States must register in the ADJ Advantage program to enroll. 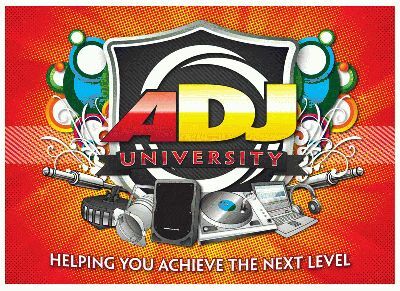 DJs who already are ADJ Advantage program members simply have to enter their membership number to enroll. There is no cost or obligation to enroll in the learning program. As a virtual online school, American DJ University won’t have any frat houses, pep rallies or wild celebrations after a big game, but in many respects, it will be the “ultimate party school,” because the lessons its students learn will help them put on better shows at parties, events, weddings and everywhere else. When this happens, American DJ will be able to say that its educational program earned an A+.